My husband, Dave, has always been active: running, cycling, tennis, hockey, swimming. Unlike me, he doesn’t work towards a goal; he simply works out when he wants to, doing what he feels like at the time. Last year, he toyed with the idea of doing a tri and spent a lot of time in open water. It will still be a while before he gets to the start line, especially when he only did this year’s first open water swim last week. 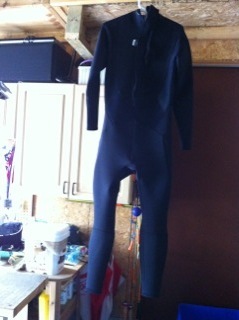 The day after, Little Ironman and I went through the garage and he stopped in awe when he saw Dave’s wetsuit.